Welcome to PhysicalCultureBooks.com - The best site on the web for vintage strongman books, old bodybuilding literature, iron game history & physical culture. Here you will find a growing assortment of classic (restored and republished) books and manuals that hearken back to the days when virtues such as strength, honor, and hard work were held in high esteem. You won't find books here that give "shortcuts to 20 inch arms in 20 days." You will find good honest and time-tested wisdom from the days when physical culture meant training the whole person to be strong, spiritually, mentally, and physically, and not by cheating using steroids. 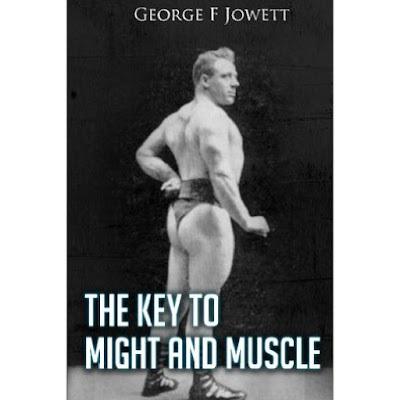 You will find books that hearken back to the glory days of physical culture, the days of such great men as Saxon, Sandow, Hackenschmidt, Calvert, and Jowett. The Five Best Vintage Strongman Books Ever Published - These Are Must Have Books! We at physicalculturebooks.com strive to bring back old knowledge and wisdom from the gilded age, where men were proud to be men, and hard work, perseverance, good sense and wisdom were prized highly. The wisdom of that age was reflected in everything of that time, from the gorgeous and beautiful construction of buildings and bridges (contrasted to the bleak, plain, and empty minimalist architecture of today) to the development of the human being (hard work and wisdom forming the ideal of the human man). We strive to preserve that wisdom and make it available to all. Come on in and browse through the growing list of books and manuals of that era, and enjoy! ​10 YEARS (1994-2004) OF BOB'S HARDGAINER ARTICLES! ​"Super Natural Strength is a great source of information for anyone who wants real drug-free strength training, without hype, fads, worthless supplements or training advice from steroid users." One of the most important and most under-rated figures in the history of physical culture. He was the founder and publisher of STRENGTH MAGAZINE and the founder of MILO BARBELL COMPANY in the early 1900's. MILO was the first mass produced plate loaded modern barbell. STRENGTH magazine was an early leader in physical culture and many famous legends of the Iron Game such as Mark Berry, John C. Grimek, and many others, got their start there. This book is considered by many strength historians to be "The Bible" of modern muscle building and weight training. The great John C. Grimek kept only one book on his book shelf by his desk at York Barbell and it was his copy of SUPER STRENGTH. (This is according to Jan Dellinger who shared an office with him.) This book is truly one of the most influential in the history of the Iron Game and Physical Culture. Alan Calvert's original 1911 classic: THE TRUTH ABOUT WEIGHT LIFTING. The text remains exactly as written in the original 1911 edition with many photographs and illustrations. This interesting book focuses on what feats of strength were real and what were just stage pranks. Stage trickery and exaggerated claims of strength were rampant in the early 1900's. Calvert attempts to expose the tricksters and credit the honest true strongmen. The classic book is a must have in your physical culture collection.